Amazon HQ2: Is A Mega-Deal Always Worth It For A Community? Amazon's unmatched promise of 50,000 well-paying jobs has red carpets rolling out across the U.S. — but also some soul-searching. How much should communities subsidize wealthy American corporations? Amazon's Seattle campus has ballooned in size as the company became one of the world's fastest-growing businesses. Now, cities are deciding how much they are willing to give to lure Amazon's second headquarters. 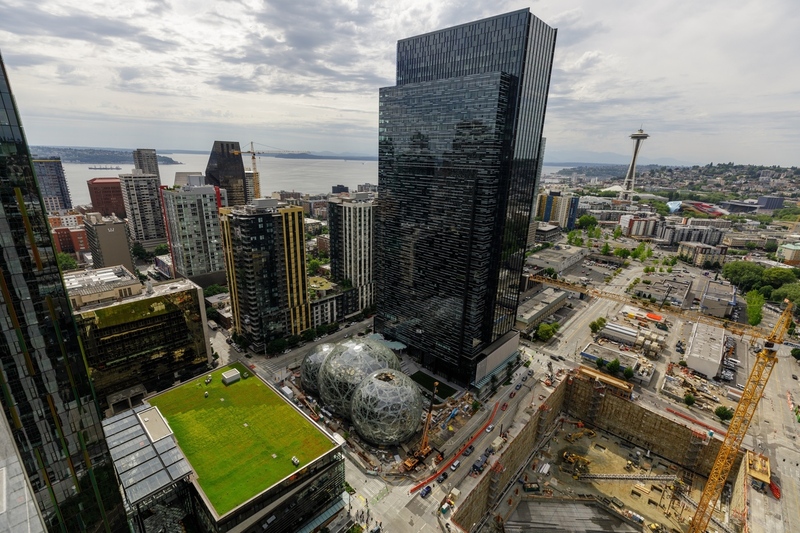 Thursday marks the deadline for bids in Amazon's highly publicized search for a location for its second headquarters, dubbed HQ2. Cities are clamoring to land the conglomerate's project and its unparalleled promise of up to 50,000 jobs paying an average of $100,000, at one of the world's fastest-growing companies. But with that comes some public soul-searching: How much should a city or state subsidize a wealthy American corporation in exchange for such a shiny promise? "There is a whole system in economic development that has pitted states and cities against each other for corporate relocations. Amazon just happens to be very good at it," says Amy Liu, who runs the Metropolitan Policy Program at the Brookings Institution. Corporate subsidies, by one conservative estimate, top $70 billion a year. That's what cities and states give away in foregone taxes and other concessions to companies — sometimes for the prospect of new jobs and sometimes just to keep existing ones. In some cases, all the competition does is get concessions from cities that the company would have picked anyway. Amazon representatives have insisted that the company didn't begin soliciting HQ2 bids with a pre-existing choice. Either way, "it's created a major distraction from what the real day-to-day economic development activity should be," Liu says, meaning the long, arduous work of grooming and nurturing locally grown businesses. When communities chase megadeals, they're hoping for an influx of well-paying jobs. That means more wealthy residents spending more money, boosting local businesses and maybe drawing new ones — things that are generally good for the economy. "Our concern about [the Amazon] deal is that states and cities are going to overspend for the deal so badly that they'll never break even," LeRoy says. "If you as a mayor think, 'Oh, I've gotta break the bank for this deal' ... what money will you have left to maintain the quality of life that you have?" Either public services diminish, he says, or taxes go up for everyone else. And they can leave from state to state, and they can negotiate good deals with the different states and all of that. President Trump, suggesting one way that companies can choose to stay in the U.S. In Atlanta, this worry made its way into the mayoral race. Seattle, the original home of Amazon, has seen its housing costs rise and traffic worsen with the company's growth to 40,000 employees there. Knowing that, one of Atlanta's mayoral candidates penned an open letter to Amazon framed as a marriage proposal. "While many cities will put up a hefty dowry to gain your nod," wrote Cathy Woolard, "Atlanta is a more modern suitor looking for an equal partner in success." Though Atlanta's bid submission will precede the mayoral election, Woolard made her case that the city's qualifications warranted a commitment from Amazon to help with housing affordability and transit improvements. Amazon is still figuring out its role as a corporate citizen, says King County Executive Dow Constantine, speaking from his office blocks away from Amazon's Seattle headquarters. He says he has seen this gradual evolution play out before, with another King County-based company — Microsoft. "I'm very confident Amazon is going to continue to grow its business and continue to grow as a major social and civic player," Constantine says. Perhaps in an illustration of that confidence — or just how remarkably irresistible the HQ2 competition is — Constantine's county, already home to one Amazon headquarters, has joined with a neighboring county to bid on the second HQ as well. A note: Amazon, which did not comment for this story, is one of NPR's sponsors. "I always felt we got used"
Financial incentives are among numerous criteria Amazon included in its solicitation of bids. The public response has varied. An example on one end is Canada's Ontario, already a region with booming tech jobs, saying it wouldn't play the subsidy game. An extreme example on the other end is New Jersey, with its plan of up to $7 billion in tax incentives over 10 years; Amazon expects some $5 billion in capital investments. By multiple estimates, Amazon has already cashed in on more than $1 billion in taxpayer-funded subsidies and incentives for its warehouses, data centers and other operations. Yet, there's a widely shared understanding in economic development: Tax incentives are not what drives companies. "I never made an investment decision based on the tax code," Paul O'Neill, former CEO of the industrial giant Alcoa, told lawmakers in 2001, during his confirmation hearing to be U.S. Treasury secretary. "If you're giving money away, I'll take it. If you want to give me inducements for something I'm going to do anyway, I'll take it. But good business people don't do things because of inducements." In fact, economic development officials in several states said they hoped Amazon wouldn't decide based on financial incentives. So, tax breaks are more of a cherry on top. But the competition in corporate discounts has long been part of the U.S. federalist system. Last year, President Trump even called it out in a speech, warning companies against leaving the country, but saying they "can leave from state to state and they can negotiate good deals with the different states." A unilateral decision by a state to withdraw is hard to fathom, let alone pull off. "I often thought, as governor, it would be sort of nice, if all the governors just got together and said, 'Look, we're just not going to play this anymore,' " says former Wisconsin Gov. Jim Doyle. Doyle was at the helm during the financial crisis in 2008, when General Motors shuttered plants, including a factory in Janesville, Wis. But later, the automaker said it would reopen one location, bringing back the jobs. Wisconsin put together its largest incentive package yet — Doyle says he felt an obligation to — but it lost to Michigan's even bigger offer. "I understand why they were going to Michigan, they closed more plants in Michigan," he says. "But I always felt we got used just as somebody to drive the bidding up." Since then, Wisconsin has become infamous for its eye-popping $3 billion financial incentive to get a Foxconn liquid-crystal display plant. To Doyle, however, Wisconsin's best success stories are homespun companies, like Oshkosh Truck, Harley-Davidson or health care software company Epic Systems. "That's the home run," he says. "They are less likely to be a big company that sort of out of nowhere decides to move into your state." That isn't to say, he adds, that states shouldn't and won't chase both the locally groomed businesses and the megacorporations' jobs promises. NPR researcher Will Chase and Business Desk intern Yu-Ning Aileen Chuang contributed to this report.